The writing prompt for today asks Do you have any siblings? What are they like? I have 3 sisters and two brothers. I am the oldest. My sister Elaine is 16 months younger. Next in line is my brother Raymond and he is four years younger. My parents took an eight year break from having children and then had three more. Johanna is 12 years younger then me, Adam is 13 years younger and Marie is 14 years younger. My brother Adam had quite an effect on my life, and not in a positive way. I wrote about him in a previous post. Two of my sisters know about my blog. I am pretty sure that one of them reads it regularly. So they are the two that I am going to write about. Elaine and I shared a room. She was a neat freak and let's just say I was not. We went so far as to draw a line down the center of the room to define her side and my side of the room. Our personalities were completely opposite. She was outgoing and assertive. I was shy and quiet. She was on the color guard team, I worked on the school newspaper. She dated a guy who was in my class. She went to my prom. She sat with her friends, I sat with mine. She and I got engaged around the same time. She married 6 months before me. I was her maid of honor. She and her new husband moved to the other side of the country and lived there for the next 28 years. We got along much better after we each married. I think the distance of 3,000 miles and the fact that we did not see each other very often had a little something to do with that. When she remarried, I flew out to be her maid of honor once again. She and I divorced our husbands, actually her second, my first, around the same time. Oddly enough, she met someone from NJ and moved back here about 15 years ago. When she asked me to stand up for her as her maid of honor for a third time, I asked her if she was sure she wanted to me to do that. Even thought I am not superstitious I was starting to feel as though I might have been jinxing her marriages. She assured me that she could not have anyone else play that role, after all I had plenty of practice. Our personalities are very different, but, maturity, time and common life experiences have drawn us closer together. We have each been through some hard times. She has been there for me and I have been there for her. We get each other. We have the same sense of humor, which at times may be a little inappropriate and most often very irreverent. She is my sister and my friend. Johanna is my little sister. I was 12 years old when she was born. I felt like a second mother to her. On hot summer days I took her down the shore (that's Jersey speak for the beach). She had a slumber party at my apartment for her 10th birthday. She grew up in front of my eyes. When she was old enough, she babysat for my kids. After she and her boyfriend moved in together, she would come to my house every weekend to do her laundry and have Sunday dinner. I was in her wedding as was my daughter. She was Joey's godmother and he was her ring bearer. I shared her excitement when she gave birth to Marissa. I shared her heartbreak when at age two, Marissa was diagnosed with autism. Johanna showed a great deal of strength and determination. She threw herself into learning everything she could about autism. This knowledge gave her the ability to cope with the endless red tape that she sometimes had to work through in order to provide Marissa with the necessary support and services that she required. Less than two years later, Johanna gave birth to Samantha. Sam is my goddaughter and we share the same middle name of Grace. Oddly enough Johanna and I (along with Elaine) went through a divorce at the same time. Sharing that experience brought us even closer together. Although, it was not my intention, I once made a mistake and did something which hurt Johanna. This caused a separation between us which lasted far too long. After a time I began to tentatively make overtures to try and bridge the gap between us. The wounds began to heal, but I felt the walls were still up. I think it took my mother's illness and her godson, Joey's illness to finally bring our relationship back to where it should be. She is my sister and my friend. My siblings and I may have differences in our personalities. There may generational gaps between us. Bu if you ask each of us individually about our childhood experiences we will all tell the same story, most likely word for word. Unfortunately, we are bound by a dysfunctional parental experience. Fortunately, we formed a bond because of those experiences. 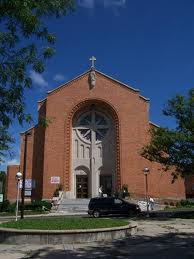 Church at St. Francis Xavier. Baby and I had dinner with the bride's parents and the Olavita's. Wonderful dinner. Went to Grandma M. at night. I have just let my mother read my blog. I'm like you, I think, I don't know if I want everyone I know reading it. So I'm going to have to get caught up on Anna's diary, that's pretty cool!!!! I really love the way you write, and especially hearing about your family. You sound like you have some wonderful sisters. That is so cool that the church in the photo might be Anna's! It is interesting to read about your family. Families are fascinating to me and I will read the stories and wonder how things got the way they are. Adam's story was particularly hard to read as I know kids who I am afraid will have his outcome in their lives. Sweet though that you have connected with your sisters. My only sister is about 7 years younger than I and , for much of her life, I was the second mother. We connected as peers when we were both pregnant with our first child and have had a wonderful bond ever since. I find sibling relationships fascinating. I am the oldest of four. I have two sisters and a brother in that order. There are ways in which I wish I were closer to each of them, but especially in my relationship with the sister closest to me in age, there is just so much stuff that has been left unsaid and unaddressed that I kind of despair of ever making those connections.